Draw-Tite - The Draw-Tite Sportframe Class I hitch is the perfect choice in a high-performing, lightweight receiver-style hitch. Each Sportframe Class I hitch is custom-built according to manufacturer and model year; Computer-Aided Design (CAD) ensures a perfect fit for your vehicle, every time. 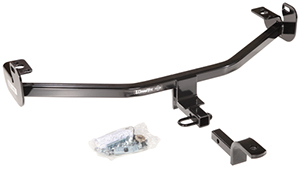 Simple, bolt-on installation attaches to frame and bumper; no welding is required. The most trusted name in trailer hitches, Draw-Tite has been at the forefront of trailer hitch design and engineering since their first products were delivered in 1946. Every one of Draw-Tite’s wide range of designs and specialized equipment benefits from a long legacy of research and manufacturing that is unmatched in the industry. When it comes to engineered designs, Draw-Tite’s is second to none. Innovative low profile designs compliment the rear contours and aerodynamic styling of today’s vehicles. Custom designed hitches are specific to vehicle type and model year for simple installation and superior fit with a minimum of bumper cutting or drilling. Removable drawbars and ball mounts enhance the appearance of the vehicle when not in use. All Draw-Tite’s hitches meet or exceed V5 CSA and SAE J684 standards and are backed by Draw-Tite’s nationwide limited national warranty.